Today Smoking is a terrible habit, annually taking the lives of millions of men and women of different ages. Wanting to save humanity from a dangerous addiction, the state comes up with a variety of methods of struggle. Scary pictures on cigarette packs, one of these targeted moves. Advertising has long been the motor trade. Marketers have always sought to create the ad, able to attract the attention of more people. However, with the sale of tobacco products, it was the opposite. Few people know, as pictures on cigarette packs in Russia proved to be practical. For the first time such flashy products have appeared in 2013 year. Then, a similar image for many seemed to be some ridiculous misunderstanding, evil joke. Among the possible consequences of addiction, there was a "stillbirth", "self-destruction", emphysema, "impotence", “lung cancer”. Appeared packaging in a short time collected a lot of conversations. Main, of which was – who is the author of such ideas. As it turned out in reality, such frightening actions of the marketer was adopted from Kazakhstan, and they borrowed it from foreign countries. To avoid awkward situations with the Ministry of public health of Thailand, has signed a contract, allowing the use of an interesting idea. Fighting a dangerous habit exists for many decades. The Ministry of health annually allocates huge amount of money for this. The reason for all the increased mortality. 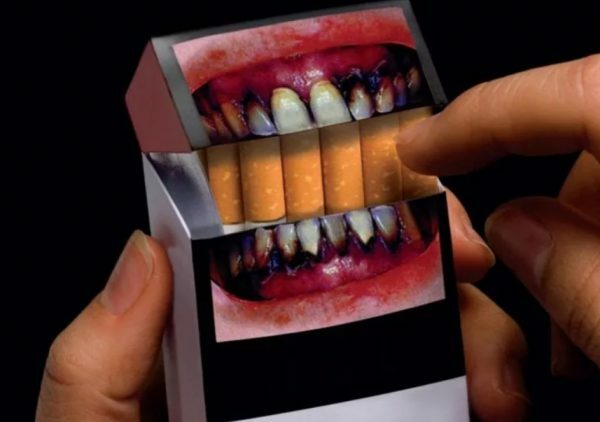 Scary pictures on cigarette packs is an interesting idea, designed for the admonition of the population. Possible, a clear view is able to show dependent, what consequences can occur. Today each sold tobacco products should contain an appropriate sign. What pictures on cigarette packs depicted, everyone knows the smoker. There is quite a harmless photo, but there are really dangerous disease, capable of provoking a lethal outcome. Conducted in the U.S. studies have shown a clear pictures is stronger, than the usual verbal warnings. About 50% cases photos on cigarette packs to remember, provoking unpleasant feelings. The first attention is usually attracted to the text, and after reviewing pictures, the result became only stronger. In Russia, the situation has positive aspects. Polls 1600 citizens, 9% refused addiction, and most of the volunteers were women. Although it is impossible to note the, who completely ignored the inscription, and 4% the respondents have confirmed – began to smoke more. Many smokers decide to cheat the system – for this purpose, people simply turn over the package, without even considering the unpleasant picture. Psychologists believe, a positive result will definitely come. And to confirm this is constantly carrying out numerous studies, testing, polls. One thing is for sure, heavy smokers with years of experience not exactly the behavior and the struggle for them is useless, as with numerous other laws. Thus, to say, as work on the creation of dependent new introduction, difficult. Much depends on the individual characteristics of each organism. I want to believe – such measures will make the population much healthier, giving him the chance to quit the deadly habit. Stopping any addiction to alcohol, cigarette tobacco or drugs — we are for the life of a man without bad habits! About all of our articles. The copy page 1 in 1 partial copying of this recording: “Pictures on cigarette packs: and is there any effect?” banned. All rights reserved. © 2014 - 2019 year.